This guy combines the strength of Durango and the elegance of Xena. 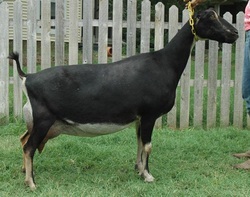 Shown 4x as a yearling and was 4x 1st and was 2x reserve behind his buddy CH Latte Da Cooper !...Shown 6 times in 2017; was 6x 1st; 5x Grand; 4x Best in Show !!! His kids are so stylish that we have kept a son, Hutzpah out of ShyAnn, and several daughters who've easily got their Junior legs. The mammaries are also wonderful !! !